Through Zapier, PracticePanther has the ability to send out SMS text messages, for specific triggers (i.e. when creating a new contact in PracticePanther). Follow the steps below to setup the SMS integration. 1) Click here, or go to Zapier.com and login. 2) Click on "Make a Zap!" 2) Find PracticePanther as the trigger app. 3) Choose your trigger (when should the text message be sent?). 4) Connect your PracticePanther account (if it's not already) Click on "Save + Continue". 5) Click on "Fetch & Continue". 6) Zapier will run a test, just hit "Continue". 7) Select "SMS by Zapier" as your Action App. 8) Choose your action, and click on "Save + Continue". 9) Click on "Connect an account" to link your phone to Zapier. 10) Enter your phone number, and the method of confirmation (Call or SMS). Zapier will send you a pin, which you can fill out in that same window. 11) Click on "Save + Continue". 12) Specify the number from which you'd like the text messages to be sent, or select "Random". Then enter the message that will be sent. 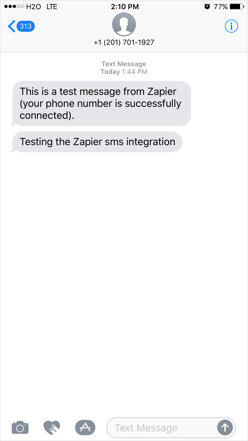 13) Test the integration by clicking on "Send Test To SMS by Zapier". 14) Confirm that all the details are correct, and click on "Finish". 15) Turn on your Zap, and you're good to go! Whenever a new contact is created (or another specified trigger), you'll receive an SMS text message.